It’s depressing, the amount of movies based on young-adult books that have been churned this decade. I have no problem with fantasy films aimed at kids, but there’s so little magic on the screen that one often wonders how the novels became so successful. The sixth Harry Potter film is interchangeable with any of the others, suffering from a lack of forward momentum and villain-of-the-weak syndrome that killed Smallville four seasons ago (though both franchises continue to lurch forward like the living dead). The Golden Compass was supposed to kick-start a parallel Potter-for-girls franchise, but was so cold and by-the-numbers that I’m surprised there wasn’t a box office ticker on the screen. Fortunately, we now have Cirque du Freak: The Vampire’s Assistant, a movie that actually made me want to read the books it’s based on. The story outline is origin boilerplate, but the details make it interesting: Darren (Chris Massoglia) is a popular high school student who visits a traveling freak show with his best friend, Steve (Josh Hutcherson). The boys witness bizarre feats by unusual performers like the wolf-man, snake-boy, and the bearded lady. There’s also a fat dancing spider, the pet of the Cirque’s enigmatic and flamboyant ringleader, Larten Crepsley (John C. Reilly); when Darren sneaks back stage to “borrow” the creature, he learns that Crepsley is actually a vampire—fortunately, he’s part of a faction that doesn’t kill humans. Through a series of events I won’t spoil here, Darren runs away with the Cirque, leaving Steve behind—not good, considering Steve is a social outcast from a broken home; he shows up later in the film, having found his own band of new friends who have no qualms about eating people. Like the Potter and X-Men series, Cirque du Freak is heavy on mythology; the key difference is that here the filmmakers remember to load the first picture with characters and action. This isn’t just a set-up movie, where we meet a lot of mutants who show off their powers and fight a really lame, low-budget enemy; where you’re just interested enough to come back for Part Two (which will inevitably have a bigger budget, and—hopefully—a more worthwhile story). Cirque du Freak wisely introduces us to the freaks, in all their CG splendor, during an early performance of their stage show; after that, they’re relegated to background players while the story and effects budget focus on the conflicts of the hero’s journey. I was so relieved when, at the epic, climactic battle, the freaks didn’t show up and use their deformities as special powers to save the day. I think the reason the movie works so well is that the people behind it know how to write and shoot for adults, which means they take the material seriously and almost don’t know how to dumb-down their work. Brian Helgeland adapted L.A. Confidential and Mystic River, and created the genre-bending A Knight’s Tale. Paul Weitz directed About A Boy and American Pie (he also produced The Golden Compass and appears to have learned a number of lessons since then). 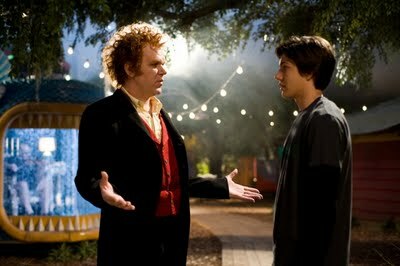 Cirque du Freak is suitable for older children, but comes off as a film aimed at adults. It doesn’t rely on talking animals or spells that solve every problem, and it touches on—but doesn’t dwell on—some heavy issues, like suicide and alienation. The movie is also visually engaging, always switching up camera angles and transitions in ways that more “legitimate” adult fare could stand to copy. I really liked Cirque du Freak, but I didn’t love it—mostly because Chris Massoglia is not a very good actor, quite the problem since he’s the lead. I get that he’s supposed to be the audience stand-in, taking in all the wonder and adventure with blank-slate passivity, but this guy doesn’t even register. When John C. Reilly either had the spotlight or shared time with Massoglia, I was in heaven, but when the focus shifted back to the Darren character only, I tuned out. Harry Potter and The Golden Compass suffered from this problem, too, and I wish studios would simply invest in charismatic, edgy leads instead of playing it safe with actors who’d be upstaged by the staples in their Tiger Beat pin-ups. Fortunately, Reilly gets a lot of screen time, along with other terrific actors like Willem Dafoe, Patrick Fugit and Salma Hayek. Unlike a lot of serious performers who seem to take guest spots in kids’ movies to please their nephews and nieces, these actors look like they’re having fun—mostly because they’re not called upon to step on rakes or make stretchy faces to get through the movie. But there’s a black hole in the center of this movie, one that can only be plugged with some solid re-casting. Meta-note: Cirque du Freak opened at number eight this weekend, which means we may not get a sequel. This is a shame. Perhaps audiences are tired of movies that look like The Spiderwick Chronicles or Bridge to Terabithia. I have a feeling Cirque du Freak will drown in the glut of bad children’s fantasy films, and can only hope it finds an audience on home video. But this is a movie that must be seen on the big screen to be appreciated. I implore you to check it out before it’s gone; you don’t even have to bring the kids.